From the first sentence on, John Waters shares his excitement as well as the pitch for 'Carsick.' You know it well before reading this review. At the age of 66, John Waters decided he would hitchhike from his doorstep in Baltimore to his doorstep in San Francisco, and share his adventures with readers. That alone is reason enopugh to makie this book worth reading. There's more than a bit of non-fiction. Before he tells us what really happened on his journey, Waters offers us two fictional versions; a best-case scenario and a worst-case scenario. Some readers may have trouble distinguishing between the two, though both are markedly different from reality. What remains the same is Waters' lust or life, his joyful celebration of everything that is human. This is a fun, funny book that offers a potent, often-poignant glimpse of America. It's quite irreverent but never irrelevant. 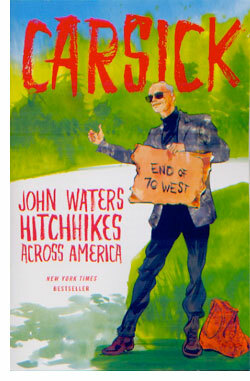 Waters is known for his over-the-top work, and he certainly lives up to his reputation in 'Carsick,' particularly in the first two sections, where his imagination runs free. Given all the wild content, it's easy to miss his superbly skilled prose. Waters knows how to turn a sentence and how to expertly layer image and action to take readers to the bizarre corners of his inner mind. Portions of the book border on prose poetry as you might hope to find on the bathroom walls for a surreal funhouse. All this wordplay and extreme exploration is very funny, but Waters also excels at storytelling and plot. He can craft a vivid character, and in a few short pages tell a whole story that feels real, or at least surreal. In the non-fiction section, things are considerably calmer, but the absence of Waters' imaginative powers is compensated for by his charm. He clearly charms his rides and everyone charms the reader. Waters seems to like everyone he meets, imagined or real, or at least he's able to sympathize with them. We like Waters. We like his rides, real and imagined. It's a grand time. 'Carsick' is so much so simply itself that it defies all genres and all attempts to contain it. Waters nails contagious fun. He'll make you want to hitchhike. You could only hope that it would be Waters himself to give you that ride. In this book he manages to do so.